I’m a girl who loves cars. Yo soy un chica que sinceramente me encantan los autos. I’ve driven sports cars, convertibles, SUVs, compact cars and minivans (surely my least favorite). I was invited by my amigos at Pines Ford Lincoln to spend a long weekend in a 2014 Lincoln MKX since I’m in the market for an SUV to downsize from my current minivan. The MKX is part of Lincoln’s ‘MK’ luxury SUV-crossover line that offers various sizes to fit your family and lifestyle: the larger MKT with a third-row option, the MKX midsize SUV crossover and the all new MKC for a smaller, but top-of-the-line experience. I have to report that I truly enjoyed the MKX! Really- what is there not to love? Yes, it is a luxury vehicle that competes in the ranks of the midsize Lexus and BMW SUV crossovers. Since there is no third row, this gives the MKX much more storage capacity in the back than others in its class. To start, the available colors for the MK series crossover SUVs are attractive. I learned that one of the colors created for the smaller MKC – Tahitian Pearl– actually is based on a very unique lip color in the ‘Besame’ collection created by Latina designer Gabriela Hernandez. 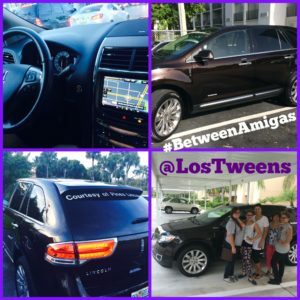 This is such a unique story and I appreciate the opportunity for a Latina to impact the allure of a luxury vehicle. And it really is a cool color! The warning lights on the rearview mirrors that warn you when a vehicle is in your blind spot. The stability- I felt this car was almost glued to the road but so smooth and quiet. The responsiveness. From the gas pedal to the steering wheel, the MKX is a very responsive vehicle that quickly turns and adapts to sudden moves. I felt like a true driver in this vehicle just enjoying the road even with all the Miami traffic. The sound! I noticed the amazing sound quality as soon as my tween daughters rushed to turn on the music. Then I learned that it is a THX@ system which makes sense since it sounds like a movie theatre! Throughout the weekend we listened to a wide variety of music from classical to rock to pop and Latin with all of them sounding as good as the next. The dual sunroof. It allows the sun to shine in nearly across the entire roof. Of course when its raining it is a unique feature as well. Close it up and the car is ultra quiet again. The SIRIUS navigation system with Traffic and Travel link. While it is an optional feature of course, it is well worth the expense since it is very easy to use and so convenient. The style. The vehicle is classy while modern and sporty. The MKX certainly appealed to me as a woman but my husband thoroughly enjoyed it as well. It has been a long time since I’ve driven a luxury vehicle and I was pleasantly surprised with the Lincoln brand and the MKX SUV crossover in particular. I feel it’s just the right size for a family of four. There is room in the back for three passengers so my twins can always bring a friend. The storage was more than ample and since the seats can flatten, you also can load bigger items. Enjoy a test drive soon- it’s worth a look. This entry was posted in Product Reviews and tagged cars, Family, Lincoln, lipstick, women. Bookmark the permalink.